Whenever we encounter something new on our travels, there is a genuine sense of excitement. Occasionally this sense of wonder is eclipsed, as we realise the new species in question is not remotely like anything we've ever seen before. From a distance the Tachinid Fly above sounded just like a bumble bee, albeit one that was particularly cross with itself for losing its bearings. It looked vaguely like a bumble, too from a distance, and was roughly the right size. Then it buzzed our way and came to check us out. I know it's viewed as a cardinal sin in many quarters to anthropomorphise but in this instance I simply couldn't help myself. Up close, it's the eyes that have it: an alien's eyes that I imagined bulging and leering, when in their compound reality all they were probably doing was looking. I looked at the bristly, hairy fly and somehow I couldn't stop thinking of the actor Peter Lorre: a swarthy Peter Lorre, mind you, who had perhaps had a pint tipped over him and couldn't wait to get even. 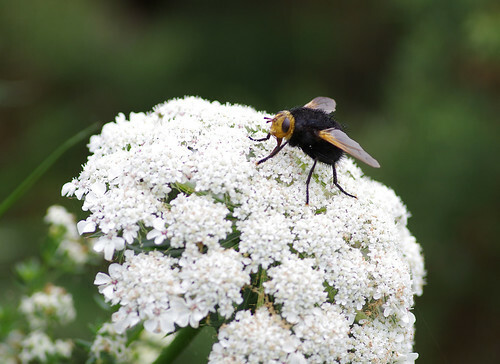 Although there are well over two hundred species of the Tachinidae family, I am reasonably confident we saw the species Tachina grossa because Sherry's picture exactly matches one found in The Wildlife of Dartmoor by Norman Baldock and John Walters. The life cycle of Tachinid flies certainly gets off to a gruesome start, as the eggs are laid on caterpillars. The larvae then become parasites, eating away at the caterpillar until killing it! We bore this in mind while delicately combing the grasses for caterpillars. We found only two: well-hidden, down in the dried grasses, and did not think it fair to disturb them with the Tachinid on its buzzing patrol! 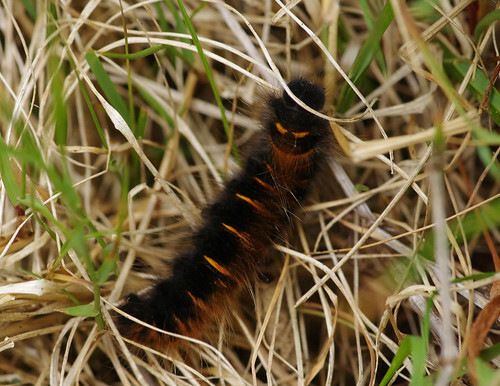 We are finding caterpillars notoriously difficult to identify. For one thing, they pass through stages of growth known as instars. So they can be of varying size, more or less furry, develop a different or more striking pattern at different stages of their development. And that's just what one species is capable of! In the case of our two specimens today, left to munch and hide in peace among the undergrowth, the furry one is likely to emerge as a Fox Moth, while the second specimen we found (with the fearsome blue spike at the tail-end) could well turn into a Hummingbird Hawk-moth. Unfortunately, the shots did not turn out well on this occasion, and so we moved on. While we're on the subject, I should also mention the Female Holly Blue, resting on a bramble leaf, beyond the edge of the coast path. There was a steep drop, obscured by the brambles growing out of the cliff-top. I'm lucky to be taller than Sherry and could lean in considerably closer without risking life and limb but regrettably I also suffer from "shaky hand syndrome", which meant my Holly Blue pictures may have been bigger but sadly resembled smudged blue shapes on a leaf. 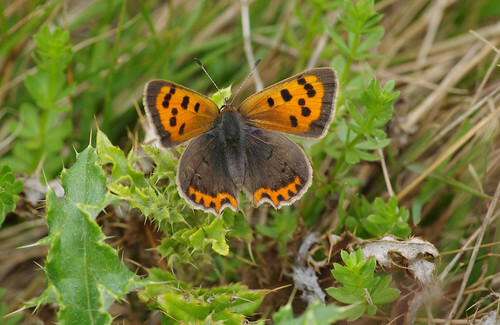 Elsewhere, it was a great day for what Patrick Markham, author of The Butterfly Isles, would call "little brown jobs", butterflies that seem fairly non-descript at first sight, until you begin to examine them more closely and discern the subtle differences between them. I don't think we could ever match Markham's epic feat of recording every single British species in a single year. Come to think of it, I'm not sure I would want to try, fearing the crushing weight of disappointment if things did not go according to plan. 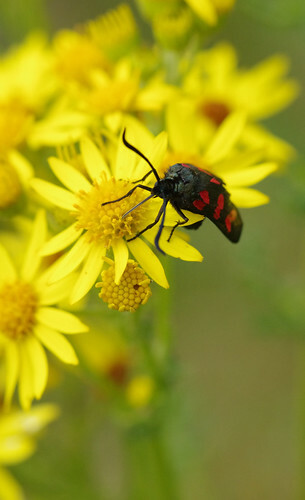 The moth above can be distinguished by six spots on each wing, whereas the Five-spot Burnet has one less. 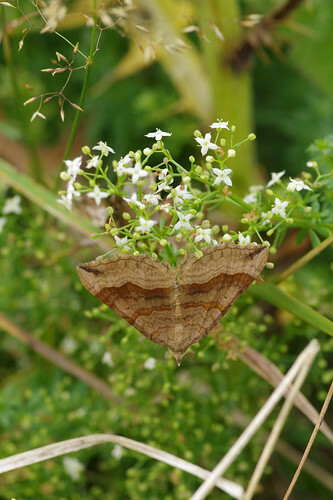 And when you come to the "little brown jobs" of the moth world, things start to get decidedly more tricky. At this time of year, the South West Coast Path is also a wonderful place to find flowers and flowering trees. 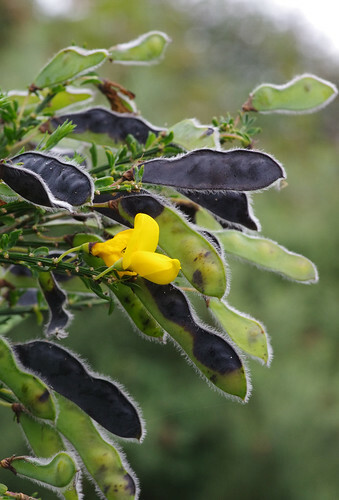 I really love the contrast between the yellow flower and the furry seed pods on this broom. And Sherry has captured the light really well here, I think. Much of the habitat where we wallked today has been naturally grazed by ponies, encouraging the plants and flowers to thrive. 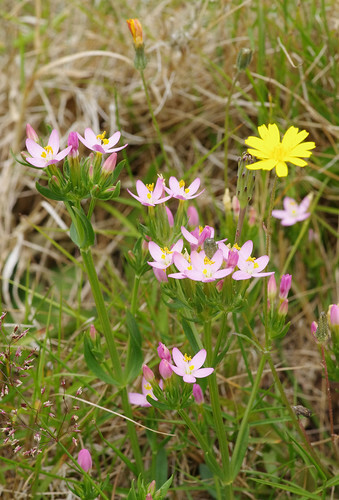 These centaury flowers, with their welcoming splashes of pink, added another layer of beauty to our already outstanding surroundings. Apparently, they are as common in these parts as their name suggests, yet I cannot remember seeing them here before. I will certainly be looking out for them (and the many other coastal flowers) in the future. What a fresh and vibrant website! Sherry's beautiful images have a lightness that captures the life force of what she photographs and Jason's well-informed and interesting text expresses their mutual passion for their exploration of the natural world.